FILE - Turkmen President Gurbanguly Berdymukhamedov (L) shakes hands with Afghan President Ashraf Ghani (2nd-L), then-Pakistani Prime Minister Nawaz Sharif (2nd-R), and Indian Vice President Hamid Ansari during a ceremony in Ashgabat, Turkmenistan, Dec. 13, 2015. Afghanistan will host leaders from Turkmenistan, Pakistan and India on Friday for the ground-breaking ceremony of the Afghan section of a much-delayed multi-billion dollar gas pipeline connecting the four nations. The 1,814-kilometer pipeline will carry an estimated 33 billion cubic meters of natural gas annually for the next 30 years from the world's fourth-largest reserves in Turkmenistan. Pakistan's relations with Afghanistan and India have since deteriorated over allegations Islamabad is not doing enough to stop terrorist groups from using its soil for attacks against the neighboring countries.Pakistani officials deny the charges. "Today, given the energy requirements in India, there are several gas pipeline proposals before us. We are, however, strongly committed to TAPI pipeline project," Akbar was quoted as saying. The Afghan government and business community also see the pipeline as a milestone in the war-shattered country's economic development. Kabul is expected to earn up to $500 million annually in transit duties and the project will help create as many as 25,000 jobs, local media quoted Afghan analysts. 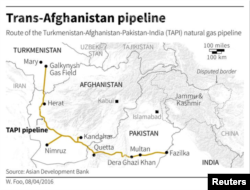 The pipeline mostly runs through parts of southwestern Afghanistan where the Taliban insurgency controls or influences many districts. But a spokesman for the insurgent group, Zabihullah Mujahid, says it supports the project and will ensure the pipeline's protection.